On 25th March 2017 join thousands of people across the globe to raise awareness of endometriosis, taking part in the fourth Worldwide Endometriosis March. This year there are for events four events happening across the UK - London, Manchester, Cardiff and Glasgow. We’ll be joining 46 other countries who are taking part in the Worldwide Endometriosis March or ‘Endomarch’. The march is an opportunity for those affected by endometriosis to have their voices heard as a collective; raising awareness of the condition, its impact on patients and empowering women with knowledge and confidence when seeking medical help for endometriosis symptoms. Raising awareness of endometriosis to both the general public and health professionals is key to achieve earlier diagnosis and so earlier access to treatment; women in the UK should not have to suffer an average of 7.5 years before diagnosis. How can I get involved in the UK? If you are able to, gather your friends, family, colleagues and dogs, wear something yellow and join us on 25 March 2017 to raise awareness of endometriosis! The routes of each event vary in length, for example 3km in London and 3 miles in Cardiff. If you don’t feel up to walking the distances, why not help to make some signs, design posters or advertise the event in your local area? You’re very welcome to come along to the start of the march even if you don’t want to complete the route. All events are free. Everyone attending is however asked to register (links below) so organisers know the numbers attending and can plan accordingly. If you want further details, or would like to help out on the day, contact the organiser of your nearest march via their Facebook page (link below). 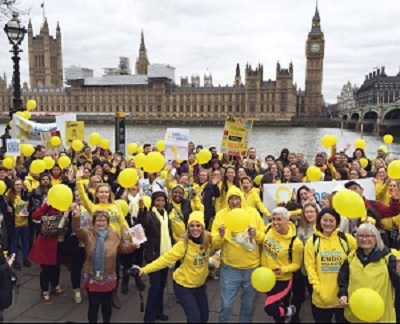 Endometriosis UK would like to thank all the wonderful volunteer teams for their hard work in planning, organising and facilitating the UK marches.